You are here: Home / Misc. PowerPoint Tips / Results of survey: What resources would help you improve your presentation skills? Thanks to all of you (about 100 people) who answered the survey! 1) What version of PowerPoint are you using? 2) Which books would help you most with presentations? Online resource for material for presentations: templates, video, photos, eetc. 3) Would you attend webinars on specific topics (not free)? 4) If yes or maybe, which webinars would you attend? How to convince the people you work for not to commit death by PPT–all the skills and creativity and knowledge of a presentation designer cannot overcome resistance by higher-ups who seem committed to boring their audience–they’re still using full sentences! Presenting Live Webinars for persuading, motivating, teaching and informing – in 25 minutes or less! Basics: Quick simple show: use this background and font and colors. So it can setup in 5 minutes or less. A lot of the stuff on PPT is focused on or derived from the business world. I know many of the principles, etc. are useful, but it would be nice to see more info on how to incorporate these ideas into academic presentations – where we can’t get away with a 20 minute presentation, for example, but “have” to lecture for 45-50 minutes. Would you be interested in group coaching? Is there any other type of content or class that you’d be interested in to improve your skills? No, but thank you! Your web tips are tremendously helpful, and I follow your work closely. Great job!! Show & tell — show me how you do some of the cool graphics and give me tips on how to accomplish them. Interested in how to integrate other software and programs with PowerPoint and what formats to use. For example, when adding a movie clip, what format is the best so it will run in the PowerPoint on your computer and also run if it’s uploaded to the web. What add-ons are most useful and how to use them. Death by PowerPoint is really important for us here!!! Back to Basics, where to stand, how to set up room to focus on presentation, a refresher for us that don’t train often, but used to train a lot in our distant past. Working with maps. Embedding audio, video, photos without going thru the steps- macro maybe? PowerPoint design for people who know more than non-designers and less than designers. 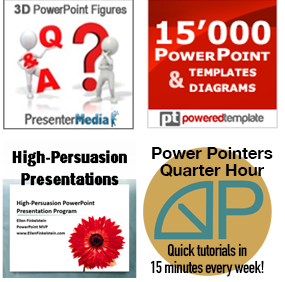 Tips on teaching adult educators how to use PowerPoint in their classrooms. Anything involving trials, I work in a legal area. Helping college faculty redesign their PPTs. More along the lines of convincing them to redesign! I will be doing some webinars in the future. Some of the resources you asked for are already on my site or in existing books. I’ll mention these in a future post.